It's been a bad week for sports fans in this country. The Danes got even for Clontarf and the French bought a World Cup from the greedy Celts. So in the one week we lost the holding of a rugby World Cup and the going to a soccer World Cup. This was the year when Black Friday fell on a Tuesday. As usual, we made jokes about the soccer exit. We seem to crack jokes about every sporting calamity in this country. Maybe it's our way of saying there's worse that could happen. My favourite was "never mind, the Guinness is sh*te in Russia". We did beat Fiji in the rugby on Saturday but what have Fiji ever done to us? What we wouldn't have given to beat Wales and Scotland. You couldn't but like the Fijians, who, to the best of my knowledge, have never invaded or betrayed their fellow Irish islanders. Unlike more I could mention. There is a Fijian water which has become very popular and competes with our own waters, and it may seem strange for a country with so much water to bring water in. The Fijians know all about the perfidy of World Rugby, who allow big countries to plunder the playing populations of small countries. This week Samoa went broke. The island nations rear their players for export. But good luck to Fiji. They never wronged Ireland. And Fiji nearly beat us but for the boot of Ian Keatley who has found some resilience and strength of character in the last year or so. As for Scotland and Wales, our Celtic brothers, well it's high time we declared war on account of their not voting for us. The plain people of Wales and Scotland were disgusted by the behaviour of their representatives who, for whatever reason, opted to put politics before friendship. France, who were awarded the World Cup, have a very bad record at keeping control of the many terrorists who have infiltrated French society. The French bid echoed some of the First World War generals who declared, with some certainty, the conflict would be over by Christmas 1914. The French rugby security section, in their application to hold the World Cup, expressed a wish that terrorism would be over by 2023. The Scots and the Welsh voted for France. Ireland went after the South Africans but it was the French who we should have concentrated on. So being full of bitterness, as the betrayed always are, I propose we pull out of the Celtic whatever it is league, and join up with the English Premiership. I'm serious. Think of big games every week against the likes of Saracens, Wasps, Bath and Leicester. This is not the first time the Welsh and Scottish unions have let us down. England were the only home nation to show up at Lansdowne Road when the Troubles were at their worst. Wales and Scotland could turn their backs on us at any time. The people are lovely but the rugby overlords are not to be trusted to carry out the wishes of the supporters. Italy let us down too. So did Argentina. The Irish priests started off rugby in Argentina. And we sent Conor O'Shea to Italy. Nice thanks. I suppose you could be fighting with whole world if you put your mind to it. But Ireland were very good to Argentina when rugby was struggling there. Maybe we should just take our beating but then there was the enemy within who were afraid the Irish people would be happy for a while. We had a very good and sensible bid. There was a lovely spread of games all around the island of Ireland. There were a few Fianna Fáil politicians who proposed an enquiry into how to the Government contribution of €1.5 million to the bid money was spent. Lads, the cost of the bottled water alone would bring the bill for the enquiry well over the €1.5 million. The facts were that we found out who our friends are - the hard way. The soccer was a terrible blow too. I was very upset at some of the criticism levelled at Martin O'Neill. He brought us to the Euros last year in France and this time around we got within one game of qualification with a squad of players who gave their all. That's all you can ask. O'Neill is a decent man, and an honest man, who played the hand he was dealt without ever pulling an ace from the bottom. I was at the game against Belgium in Bordeaux last year when we suffered a similar catastrophe. The fans stayed until well after the final whistle. There wasn't a hostile word. Quite the opposite in fact with songs of praise and 'Te Deums' to the players for giving us the chance to cheer in France. But there is hope for Ireland. We always seem to manage to become the best in the world at some sport. For a while it was snooker players, and then the cyclists, the cross-country runners, and so on. Now we have the Skibb gang in the rowing. The nature of victories in small countries is cyclical. We cannot expect to have the best in the world, or win all the time. 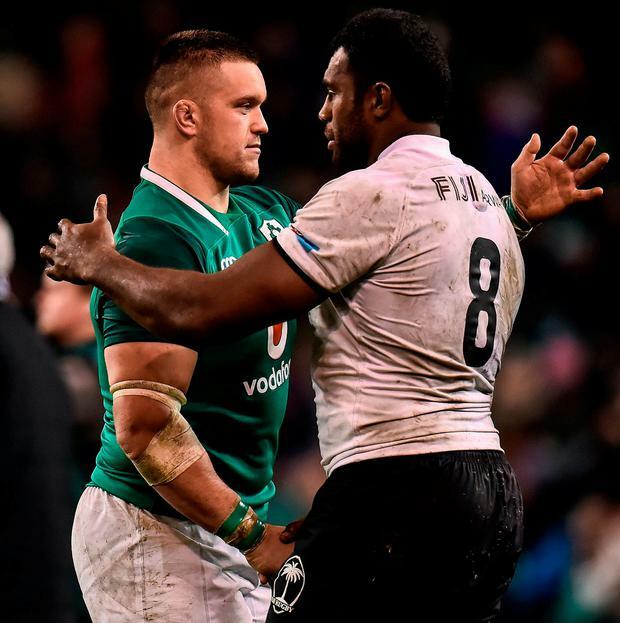 Just as when a team made up of three or four or five brothers, with a couple of first cousins thrown in, can backbone an All-Ireland club win, the same is also true at international level. It's about chance. Christian Eriksen happened to have been born in Denmark on St Valentine's Day 1992. That's the difference between victory and defeat. If Eriksen was born in Dundalk we would have won. So the good news is never far away. You just have to know where to look, out and about on the waters and the wild. Remember Skibbereen.